This section will provide access to major components of Center technology. The example provided here is for BCI2000, the general purpose software platform that is used by all Center technologies as well as by researchers throughout the world. Full information on obtaining and using BCI can be found in the "Technology", "Training", and "Support" sections of this website. BCI2000 is a general-purpose system for basic and clinical neurophysiological research. It can also be used for data acquisition, stimulus presentation, and brain monitoring applications. The mission of the BCI2000 project is to facilitate research and applications in the areas described above. Our vision is that BCI2000 will become a widely used software tool for diverse areas of real-time biosignal processing. 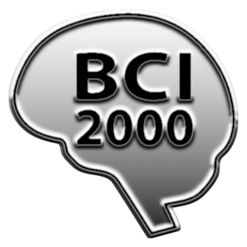 The BCI2000 system is available for free for non-profit research and educational purposes. We have provided it to over 1200 groups around the world. BCI2000 development has been supported by an NIH (NIBIB) R01 grant to Dr. Gerwin Schalk and an NIH (NIBIB/NINDS) Bioengineering Research Partnership grant to Drs. Jonathan Wolpaw and Gerwin Schalk, and it is currently supported by an NIH R01 grant and a U grant to Drs. Gerwin Schalk and Peter Brunner.